Gulf View, Beautiful Interior! Elevator, Private Pool, & Outdoor Grill! Welcome to Over The Top! “Over The Top” is a beautiful, three-story coastal home which offers breathtaking views of the Gulf of Mexico. 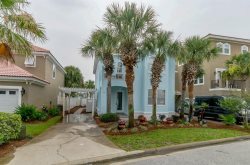 Located in the gated community of Destiny East, “Over The Top” sits on one of the highest points in Destin.Watch the inspiring sunrises and sunsets from one of three southern decks that run the length of this beautiful beach home. “Over The Top” sleeps 24 guests, has 6 bedrooms, and 6 bathrooms. On the first floor is an elegant and bright entryway with a grand staircase as well as a private elevator. For sleeping arrangements on this level there is a bunk room and a King Suite. The bunk room exudes a cheerful atmosphere and features 3 sets of custom built queen-over-queen bunk beds. The King Suite includes a private bath. There is a shared full bath on this floor. For entertainment there is a game room conveniently located near an entrance to the private pool. The game room includes a wet bar with bar seating and a pool table. The private pool overlooks the spectacular emerald green waters and sugar white sand of the Emerald Coast. On the second floor is an modern, open-concept living, dining, and kitchen area. This luxurious main living space is bathed in natural light during the day and features intricate, high-end details that pull together the perfect space to relax with company or entertain. The gourmet kitchen offers granite countertops, stainless steel appliances, and an island that also serves as a breakfast bar with seating for two. Perfect for conversations while cooking! The formal dining area offers gulf views and seating for 8. There is additional dining space for 6 guests by the outdoor kitchen on the balcony. For sleeping arrangements on this floor there are 2 King Suites. Each King Suite on this floor includes a private bathroom. The third floor is mostly encompassed by the magnificent Master King Suite. This expansive room is a marvel in itself featuring a private, furnished balcony with Gulf views; living area with fireplace; two huge walk in closets; and a jacuzzi tub and walk-in shower. This suite has a custom built twin-over-twin bunk bed. A Queen Suite is also available on this floor and features a twin-over-twin bunk bed. “Over The Top” is within walking distance to beachfront restaurants and the Destiny East Community Center which offers a large pool, fitness center, tennis courts, basketball courts, walking/pet path, large playground, grilling/prep station, and private movie theater! Beach access is conveniently located down the street. This home has PUBLIC beach access at the Crab Trap. *This home rents only Saturday to Saturday during Spring Break and Summer months. Please call our office if you have any questions. *Weddings/Events – If held on property an additional $500.00 fee is required. This home has public beach access. Pool Heat — From October 1st - May 1st, the private pool/spa can be heated for an additional $50/day or $300/week. Pool heat must be purchased for the entire stay. Private pool AND Community pool. The private pool can be heated from October 1st - May 1st.